José Mourinho made it perfectly clear before his Manchester United took on Feyenoord in the none-too-eminent Europa League exactly how few fucks he, his players, and his club gave about Europe’s JV continental competition. 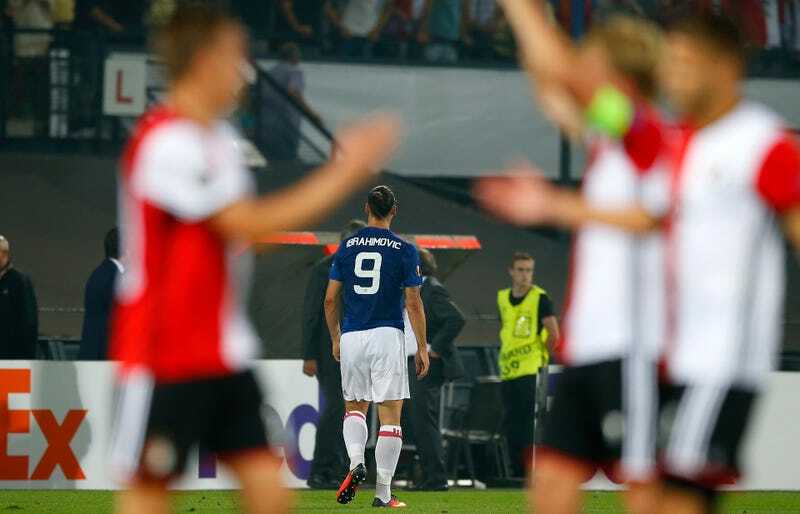 Karma responded, in its typically darkly funny way, by handing United yet another embarrassing Europa League L against a team they have no business losing to. Mourinho isn’t wrong at all to give no shits about the Europa League, of course. His analysis that the competition is more likely to hurt United’s chances of achieving their real goal this season, winning the Premier League, is right. Unlike a team like Liverpool last year, United have a better chance of attaining what must be their second most important aim—a swift return to the Champions League, where they will face teams closer to themselves in world renown—through a top-four EPL finish than the automatic group stage spot that comes along with winning the Europa League. For those reasons, it is completely sensible that Mourinho would prioritize league play. However, none of that precludes us non-Man U fans from giggling at Big Old United when they fail while slumming it in the Europa League. Like Mourinho, I too couldn’t be bothered to care about the Europa League generally—at least not this early in the tournament, which has a group stage overflowing with random teams from offshoot European domestic leagues that I have no knowledge of nor any interest in learning about. All of which is to say, even when the rich and famous and arrogant and, as of late, continually humbled Manchester United pop up in tourney play, I don’t make it a point to watch. Here’s what I do know: a United team featuring David de Gea, Paul Pogba, Juan Mata, and Anthony Martial in its starting lineup, and one that brings Zlatan Ibrahimović on from the bench, should not lose to a Feyenoord team starting two old Liverpool washouts that only finished third in the Dutch league the year prior. That this upset did indeed happen—especially to a United club and manager and fanbase that finally have genuine reason to believe they’ve escaped the shadow of the long black cloud that has darkened their post-Fergie days, and thus have become rather chesty while crowing about their imminent return to the top—is an irresistible morsel of our favorite flavor of schadenfreude.